For Bacardi, environmental sustainability is good business – an approach that dates to the very beginning of the company more than 156 years ago. When Bacardi founder Don Facundo Bacardí Massó started his business in 1862, he accepted the Spanish government’s challenge to reduce surplus amounts of molasses in Cuba, leading to the crafting of BACARDÍ® rum. Repurposing old whisky barrels to age his rum was also part of his original plan, a practice still in use today. Water: clean water is fundamental to our business and we recognize the importance of water conservation. Climate change: the fossil fuels we consume in our value chain process to operate our facilities, manufacture our products, and transport them to our customers, creates greenhouse gases that contribute to climate change. Waste: effluents and waste from our operations need to be kept to a minimum as well as the use of our materials in bottling and packaging to reduce the overall impact on the environment. Announced in early 2014, Good Spirited was an ambitious environmental sustainability initiative with specific goals in sourcing, packaging, and operations to be achieved by 2017 and 2022 -- under the vision to return to the environment at least as much as we take away. Significant reductions have been achieved in greenhouse gas emission (GHG) intensity (59%) and water usage (50%), as well as Zero Waste-to-Landfill targets. GHG Emissions: Bacardi cut GHG intensity from manufacturing operations in half more than a year earlier than its 2017 target. At the end of December 2017, the reduction was at 59%, compared to 2006 baseline. This reduction is equivalent to taking 15,000 cars off the road each year or reducing oil use by 165,000 barrels annually. Hundreds of initiatives implemented globally at Bacardi distilleries, bottling lines, visitor centers, and offices for energy reduction were part of achieving this reduction. Among the many energy-focused initiatives, Bacardi focused on renewable energy from biogas, heat recovery systems, and wind turbines. 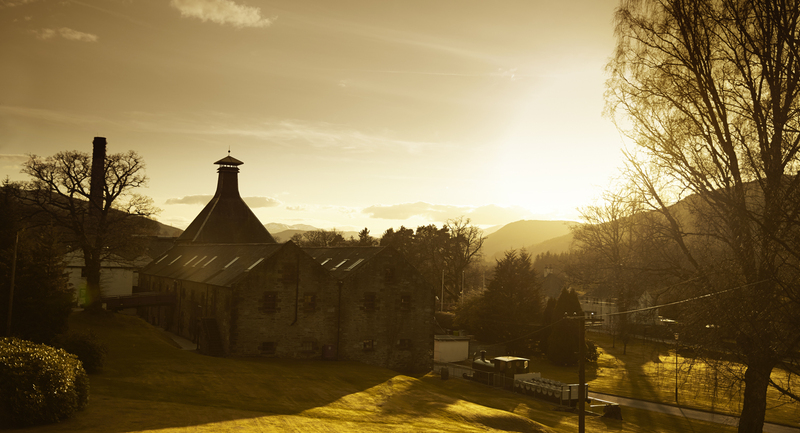 Additionally, new biomass boilers installed at the Tequila CAZADORES® facility in Mexico and ABERFELDY® and ROYAL BRACKLA® Scotch whisky distilleries in Scotland reduced the amount of fuel needed for reliable, cleaner energy. Instead of oil, renewable organic material such as botanicals, wood pellets, wood chips, and agave fibers leftover from production was used as fuel for the biomass boilers. Green electricity – including hydro, solar, and wind – contracts in the United Kingdom, Italy, and Germany were also important tools to reduce the carbon footprint. Waste: A target of achieving Zero Waste-to-Landfill from our manufacturing sites by 2022, was also set in 2014. As of the end of December 2017, 99.6% of the waste generated from Bacardi operations was diverted from landfills (only 0.4% sent to landfill), with one third of sites already achieving Zero Waste-to-Landfill status. Further initiatives focusing on reduction, reuse, and recycling are in place for the remaining sites to achieve this status by 2022. Packaging: Despite efforts to reduce GHG through glass weight reduction, Bacardi was not able to achieve the 10% packaging weight reduction goal between 2008 and 2017. As of the end of December 2017, the reduction was at 4%. This missed target was mainly driven by two factors: new packaging design implications and a refocus to overall greenhouse gas impact (understanding the implications of the full chain from supplier to distributor) instead of only weight reduction. For example, Bacardi identified contributors to GHG beyond glass weight, including furnace efficiency and transportation logistics. This learning has been key in developing new goals that focus on supplier collaboration and glass weight reduction, including production efficiency, recycled content, weight, and transportation. Building on the success of the first round of Good Spirited and the complimentary learnings in accomplishing our goals, we looked to the United Nations Sustainable Development Goals (UN SDGs) and Science-Based Targets initiative (SBTi) (a collaboration between the Carbon Disclosure Project, the United Nations Global Compact, World Resources Institute, and World-Wide Fund for Nature, with the goal to enable leading companies to set ambitious and meaningful corporate GHG reduction targets, those that are in line with the level of decarbonization required to keep global temperature increase below 2 degrees Celsius compared to pre-industrial temperatures) to set our long-term environmental sustainability targets. 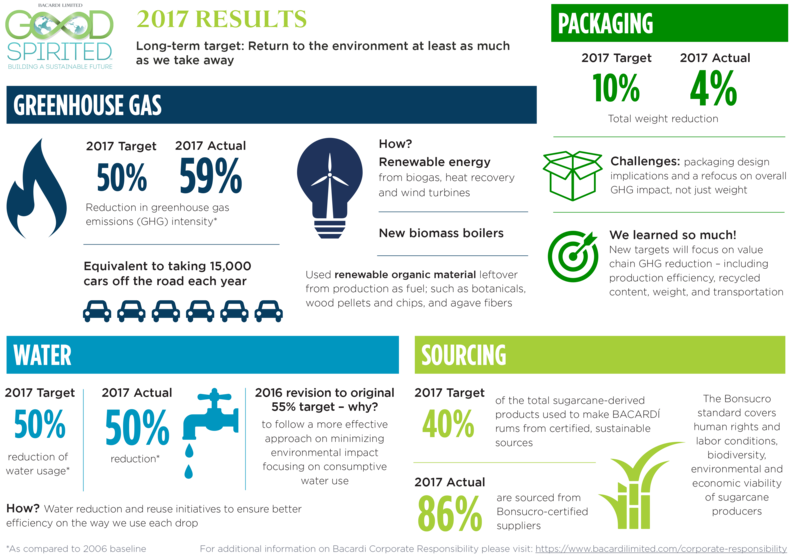 In addition, we will drive our supply chain towards a zero-net environmental impact performance in conjunction with what we will do in our own manufacturing sites. Our environmental Good Spirited global goal, announced earlier this year, is our commitment to the protecting the planet and doing what we can to ensure a sustainable future for the world around us. *Scope 1 emissions are direct emissions from owned or controlled sources. Scope 2 emissions are indirect emissions from the generation of purchased energy. Scope 3 emissions are all indirect emissions (not included in scope 2) that occur in the value chain of the reporting company, including both upstream and downstream emissions. To achieve these targets, we will work with partners to identify opportunities to protect watersheds and provide access to potable water in high-risk manufacturing site countries, work with our suppliers to reduce their GHG emissions and invest in renewable electricity and continue to focus on reuse and reduction of waste. 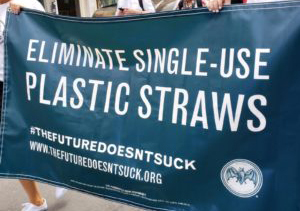 In addition, as announced in our partnership with Lonely Whale to eliminate 1 billion single-use plastic straws, we are analyzing and determining the presence of single-use plastic across our entire supply chain, including point of sale materials, and establishing a baseline and plan for the elimination of these items. When not possible to eliminate we will work towards changing to either biodegradable or recyclable plastic.